Making baby blankets for the children of the Northern Rivers Family of Services. Making scarves for homeless persons served through Bethesda House. 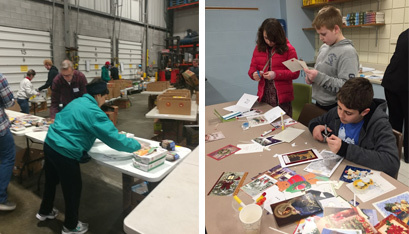 Working at the Regional Food Bank of Northeastern New York and making Christmas cards for veterans. ON NOV. 3, ABOUT 350 volunteers of all ages from Immaculate Conception parish in Glenville participated in their third morning of service. The event began with a prayer service led by pastor, Rev. Jerome Gingras. 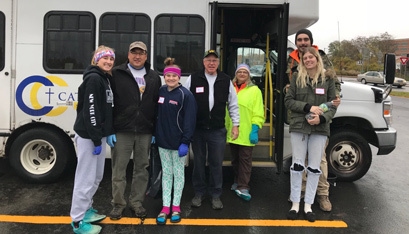 About 200 volunteers traveled to 17 sites to visit with children, the elderly and veterans and to sort and organize materials, prepare meals, paint, wash windows, scrub cemetery markers, wipe down Catholic Charities vans and clean up grounds. 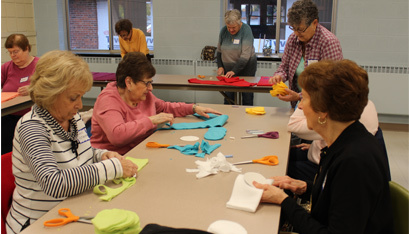 At the parish center, another 200 volunteers made items such as baby blankets, fleece scarves, meals, pet toys, Christmas cards, holiday decorations, pages for memory books and plastic yarn for 10 organizations. Many volunteers returned to the parish center for lunch, fellowship and reflection afterward. For more information, go to www.icglenville/2018-Morning-of-Service.